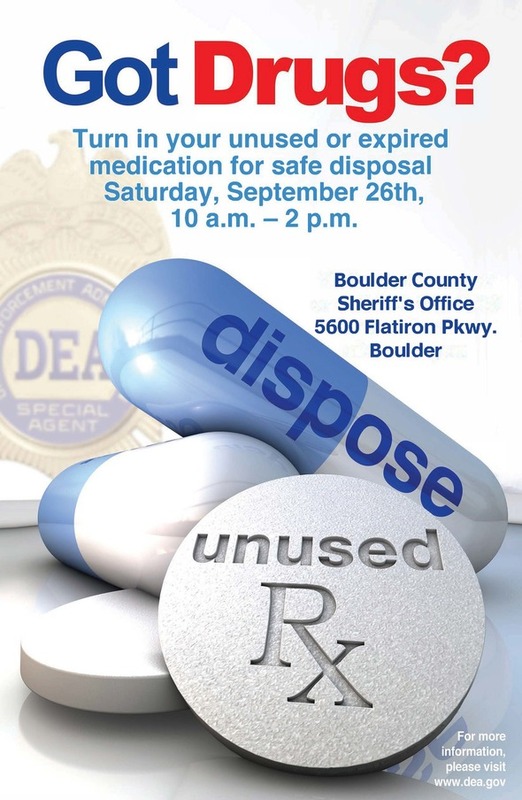 Boulder County, Colo. -- On September 26 from 10 a.m. to 2 p.m. the Boulder County Sheriff’s Office and the Drug Enforcement Administration (DEA) will give the public an opportunity to prevent pill abuse and theft by ridding their homes of potentially dangerous expired, unused and unwanted prescription drugs. Bring your unwanted pills for disposal to the Boulder County Sheriff’s Office at 5600 Flatiron Parkway, Boulder. The DEA cannot accept liquids, needles or sharps, only pills or patches. The service is free and anonymous, no questions asked. This initiative addresses a vital public safety and public health issue. Medicines that languish in home cabinets are highly susceptible to diversion, misuse and abuse. Rates of prescription drug abuse in the U.S. are alarmingly high, as are the number of accidental poisonings and overdoses due to these drugs. Studies show that a majority of abused prescription drugs are obtained from family and friends, including from the home medicine cabinet. In addition, disposing of unwanted medicines by flushing them down the toilet or throwing them in the trash, poses potential safety and health hazards. For more information about the disposal of prescription drugs and for a complete list of all the September 26 Take Back Day collection site locations, go to the DEA Office of Diversion Control site.